Bartow Arena is an 8,508-seat multi-purpose arena in Birmingham, in the U.S. state of Alabama. It is home to the University of Alabama at Birmingham (UAB) Blazers men's and women's basketball teams as well as the women's volleyball team. The arena is named after Gene Bartow, the coach who built the school's men's basketball program from scratch over the last quarter of the 20th century. 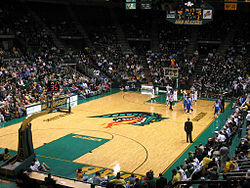 UAB initially played their games at the Birmingham–Jefferson Convention Complex Arena, but moved its games to the on-campus facility beginning with the 1988–89 season. Between 1978 and 1988, the Blazers played their home games at the off-campus Birmingham–Jefferson Convention Complex Arena, located just north of downtown Birmingham. On December 3, 1988, the men's team defeated Vanderbilt 76–69 in the first game played at the then named UAB Arena. Following the retirement of Gene Bartow in December 1996, the University of Alabama Board of Trustees voted to officially change the name of UAB Arena to Bartow Arena. Its rededication as Bartow Arena occurred on January 25, 1997, with the Blazers defeating rival Memphis 51–48. Currently playing as a member of Conference USA, UAB has won more than 80 percent of its games played there. The record attendance for Bartow Arena was set on February 16, 2008, against Memphis with an announced crowd of 9,392. At the conclusion of the 2010–11 season, the UAB men's team has an all-time record of 277 victories and 59 losses at Bartow, giving the program an all-time winning percentage of .824. Bartow Arena serves as primary home to the UAB men's and women's basketball teams as well as women's volleyball. In addition, Bartow Arena has served as home to UAB graduation ceremonies and a number of other UAB sponsored concerts and activities. In 1996, Bartow Arena served as host to the CUSA Women's Basketball Tournament. Additionally, the arena has been host to the early rounds of the CUSA Women's Basketball Tournament in 2015, 2016, and 2017. In 2015, Bartow Arena hosted the World Heavyweight Boxing Championship between Deontay Wilder and Eric Molina. In 2021, Bartow Arena will serve as a key venue in the 2021 World Games. Bartow Arena center scoreboard installed in Fall 2009. Exterior of Bartow from the southeast. Interior of Bartow during a timeout against Butler in December 2009. ^ "College". Hunt Construction Group. Archived from the original on July 13, 2003. Retrieved August 29, 2013. ^ a b c d e "Bartow Arena". 2010–11 UAB Basketball Information Guide (PDF). Birmingham, AL: UAB Athletic Media Relations Office. 2010. pp. 59–62. Retrieved March 20, 2011. ^ Norris, Toraine (January 14, 2004). "UAB top 25 moments". The Birmingham News. p. C1. ^ Faulk, Kent (December 13, 1996). "Trustees rename arena for Bartow". The Birmingham News. p. A1. ^ Scarbinsky, Kevin (January 26, 1997). "Bartows still on the go". The Birmingham News. p. B16. ^ Irvine, Steve (February 17, 2008). "Heartbreaker: Blazers' shot to win comes after the buzzer". The Birmingham News. p. D1. Wikimedia Commons has media related to Bartow Arena.